Wake up call came at 6:15 this Holy Thursday. We had another jam-packed day of Holy sites to visit before concluding the night at the Garden of Gethsemane like Jesus did 2000 years ago. We started at the Israel Museum in Jerusalem where we studied a large model of the City of Jerusalem as it was many years ago. We were able to see many of the places that we had visited thus far, and could see how the puzzle fit together in Jesus’ time. We went through what Holy Week must have been like for Jesus, and what it looked like on the model. Hani was a former teacher, and he was setting us up for all of the events of the day and tomorrow. After seeing the model, we were ready to experience it firsthand. The next stop took us to the Mt. of Olives where we visited several locations. The first of which is a location that it is believed Jesus took His last steps on this earth. A mosque was built over a rock that is believed to have the last footprint of Jesus before his ascension. We also met a cat named Jack here, and the Seniors took an immediate liking to him. After this, we went to Pater Noster (Also known as the Church of Eleona), which is believed to be the location of the teaching of the disciples of the Lord’s Prayer. The Our Father is written in 173 different languages all over the grounds of this place, and we spent some time trying to find it in English. We also read the Gospel of Matthew chapter 6 to try to delve deeper into the moment. Still on the Mt. of Olives, we traveled to Dominus Flevit (The Lord Wept); a church built where it is believed that Jesus looked over the City of Jerusalem and wept. An architectural feature of the church that many people enjoyed was the design that allowed a person to sit at the back of the church and look over the altar across Jerusalem. There was a cross placed on the altar that lined up perfectly with Calvary, and we may have had a few of our own students weep here. We then headed to the Garden of Gethsemane where a church is built on the rock where Jesus prayed on Holy Thursday night before his arrest. Here, His disciples fell asleep and Jesus wept tears of blood, because he knew, “the hour is at hand.” There was a tree in the garden that was believed to be around 1800 years old. This was obviously not a tree that was around during Christ’s passion, but it could have been an offshoot of a tree that was. After Gethsemane, we went to the church called St. Peter in Galicantu. This church was special for several reasons. First of all, it is the location where Peter denied Christ three times and the rooster crowed, but it is also the location where the High Priest Caiaphas tried Jesus. We saw a dungeon that Jesus was lowered into and left alone for several hours in the darkness. After this, Jesus was sent to to Pilot, at the place called Ecce Homo. It was very interesting to go through these things after just looking at the scale model. Good job Hani! We then traveled to the Cenacle, which was the location of the Last Supper. This building was built over the remains of the Last Supper. Hani gave us a brief history of the current building, but it was very busy so we had to move on fairly quickly. They were about to have a feet washing ceremony there for Holy Thursday. This was the location where the priesthood was established by Jesus, as well as the Eucharist. Not only were these things established, but also it was the place of Pentecost, and also where the sacrament of reconciliation was established. What a room! The next site was the Church of the Assumption where it is believed that Mary was assumed into heaven. The group prayed the Hail Mary 5 times here, and spent some time in silent reflection. Then we walked to the Notre Dame Center for Mass. It was a very nice mass, and we had several participants. Becca and I read, Luke and Bella rang the bells during the Gloria, Jill sang the responsorial psalms, and Jorge and Daniel had their feet washed by the Vatican representative for the Holy Land! Everest was very well represented! After mass we ate dinner at the Notre Dame center and got ready for our procession. We got to Gethsemane and prepared ourselves for the holy hour. The church was packed, so several members of the group spent the hour in the garden next to the church in prayers, while others prayed on the steps of the church. It was really neat hearing the gospel and other prayers in many different languages. We decided to walk ahead of the many people there on the path that Jesus took when he was arrested and taken to Caiaphas’ house. Once we arrived, we spend a little time at the top of the hill just looking over the city of Jerusalem on our last night. It was definitely a bittersweet moment. The next day we slept in a little before we prepared ourselves for the Good Friday procession. We walked through the streets of Jerusalem on the path that Jesus carried his cross 2000 years ago. Each station of the cross was marked with a large circular sign with the Roman numeral carved into it. We ended the procession at the Church of the Holy Sepulchre where Jesus was crucified and laid into his tomb. It was overwhelming to see that number of people crammed into the streets to be a part of such a powerful event. After the procession, we traveled to Emmaus to a church built in the location where Jesus appeared to two of his disciples after His Resurrection. Here we took part in a Good Friday service full of beautiful singing in French. This was the last Holy Site that we visited on our trip. We headed towards Tel Aviv to get ready for our flight. 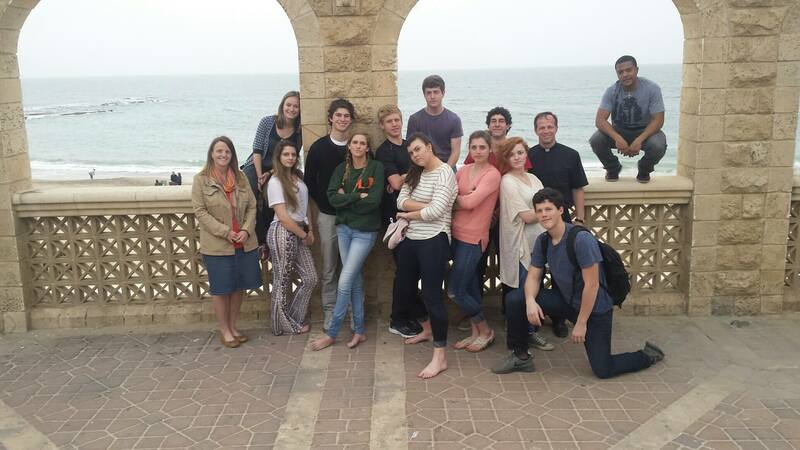 Before going to the airport, we stopped in Jaffa for a little fun on the beach and our final reflection as a group. During our final reflection, we asked the group to sum up their experience in one word. Here are some of the words that the students chose; bonding, refreshing, experience, illuminative, enlightening, spiritual, tranquility, reconnect, spectacular, reflection, and astonishing. This pilgrimage truly was a trip that changed the way our students felt about their faith. A common theme was that traveling to all of the places that Jesus walked in helped to make the Gospel come to life. Whenever we read about Jesus preaching in Capernaum, or whenever we listen to the Passion of Christ, we will be able to imagine in our heads exactly where these things occurred, and remember walking the same footsteps that Jesus walked. Not only does the Gospel come to life for our students, but I truly hope that this trip has inspired their faith to come to life in a new and special way. I know that it has for me. Thank you again for all of your prayers during this pilgrimage, and we excitedly anticipate greeting our families upon our return home.